Make this easy Chinese takeout classic at home! This stir fry of chicken, mushrooms, and a sweet sauce comes together in about a half an hour. It's just as fast (or faster!) than having it delivered. I spent most of my time in culinary school perpetually hungry (ironically). Like most college students, I was living on pennies and most of my meals came from our “Production 201” class—a course in which we prepared food for mass consumption. On the rare occasion when I had a few bucks to spare, I would indulge in Chinese takeout. Moo Goo Gai Pan — Chinese Chicken and Mushroom Stir Fry — was my go-to meal. Sadly, it seems as though this once-popular chicken and mushroom stir fry has fallen out of favor with mainstream America. I don’t see it as often as I’d like on Chinese restaurant menus anymore. This is a shame because it’s such a light, yet flavorful dish and it comes together so simply. It’s basically a quick stir fry dish of mushroom (“Moo goo” in Cantonese) and chicken (“gai”). “Pan” means slices, so the name translates as “sliced chicken with mushrooms.” The addition of snow peas and carrots brings more flavor. And what’s more, Moo Goo Gai Pan’s chicken-based white sauce can be transformed into a vegetarian or even vegan meal with just a few tweaks. Because I think a 1990s Chinese take-out resurgence is in order, I’ve decided to make my own version! Once you start cooking, stir fries come together quickly, the key to a fresh-tasting stir fry is to set up your ingredients conveyor-belt style in the order in which they will be cooked. If you don’t prep your ingredients in an orderly manner, some of them may become overcooked while you scramble to chop or grab others. Consistent slicing is also an important factor in great stir fry dishes. Make sure to slice both your chicken and your veggies thinly and uniformly to ensure they cook at the same rate. Moo Goo Gai Pan involves a great culinary technique used in a lot of Chinese cooking called velveting. This involves coating the chicken (or any other meat or seafood) in a batter of beaten egg and cornstarch. This provides a light breading which also helps to thicken the sauce and keeps the chicken from drying out during high-heat cooking. I use a whole egg so as not to waste the yolk, but, typically you would just use the egg white. If you don’t mind the waste, leave out the yolk, although I find there’s no difference in taste when using the whole egg. Just be sure to drain off as much as the egg mixture from the chicken as possible prior to cooking—otherwise it will turn into scrambled eggs when it hits the pan. Canned water chestnuts and bamboo shoots are usually found in the Asian foods section of most large grocery stores, and you can definitely find them at Asian grocery stores. They’re great to have on hand for this recipe or other quick stir-fries. WANT A VEGAN VERSION OF MOO GOO GAI PAN? To transform this dish into a vegan meal, use pressed, firm tofu and vegetable stock instead of chicken and chicken stock. Omit the oyster sauce and double the amount of hoisin—which is kind of like a Chinese barbecue sauce. White pepper has a more subtle flavor and is more commonly used in Asian cuisines. 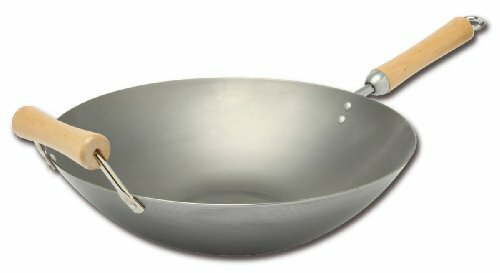 If you don't have a wok or another large, deep saute pan, cook everything in stages, removing ingredients from the pan after they are cooked in each step. Toss all the ingredients together when adding the sauce and cook until the chicken is cooked through. 1 Prep the chicken: Using a sharp knife, slice each chicken breast in half lengthwise from the thin tip to the wider end, creating into two long strips. Thinly slice each strip across into bite-sized pieces. The goal here is to create bite-sized pieces of chicken that are all about the same size and shape. However you end up with that, you're good to go! 2 Mix the cornstarch and soak the chicken: In a large mixing bowl, whisk together the egg and 1 tablespoon of the cornstarch until smooth. Toss the sliced chicken breast in the egg mixture to coat thoroughly. Allow the chicken to soak in the mixture while you prepare your sauce. 3 Make the stir fry sauce: In a separate bowl, combine the chicken stock, 2 tablespoons cornstarch, soy, hoisin and oyster sauces, the five spice powder, and white pepper. Whisk the mixture together and set aside. 4 Preheat the wok and arrange your ingredients: Begin preheating your wok, or a large, deep skillet, over high heat and turn on your stove top’s ventilation fan. Drain the chicken of any excess egg mixture and return the chicken to its bowl. Arrange your ingredients next to the stove in the following order: vegetable oil, chicken, carrots and snow peas, garlic and ginger, mushrooms, water chestnuts and bamboo shoots, and mixed sauce. This will help things go quickly once you’ve begun cooking. 5 Cook the chicken: When the wok has heated (a flick of water should evaporate on contact), carefully add the vegetable oil, quickly followed by the chicken. Stir fry the chicken for 4 minutes, tossing occasionally with a wooden spoon. 6 Stir fry the veggies: Add the carrots and snow peas and cook for an additional 4 minutes, stirring often. Make a well in the center of the pan and add the garlic and ginger. Cook in the center of the pan until fragrant, for about 1 minute, and then mix them in with the rest of the ingredients. Add the mushrooms, chestnuts, and bamboo shoots. Cook, stirring occasionally, for 3 minutes. 7 Add the sauce: Make another well in the center of the pan and add the sauce. Cook for 2 minutes, or until the sauce starts to bubble and thicken slightly. Fold the stir fry ingredients into the sauce to coat completely. Bring the sauce up to a simmer, and then reduce the heat to low. Cook for a minute longer. 8 Serve: Remove from heat and immediately serve spooned over the jasmine rice with extra hoisin sauce on the side. Leftovers are best stored apart from the rice in an airtight container in the fridge for two days. Reheat in the microwave or in a skillet on the stovetop. Hello! All photos and content are copyright protected. Please do not use our photos without prior written permission. If you wish to republish this recipe, please rewrite the recipe in your own unique words and link back to Moo Goo Gai Pan (Chinese Chicken and Mushroom Stir Fry) on Simply Recipes. Thank you! Marta Rivera is trained chef with over 20 years in the culinary field and the blogger behind Sense & Edibility. She graduated from the Baltimore International Culinary College with degrees in Culinary Arts and Classical Pastries. Her cookbook is Taste and See Cooks. Between steps 1 and 2, you don’t remove the chicken from the pan? Doesn’t it overcook? I look forward to trying this recipe, it sounds and looks delicious! It shouldn’t be an issue, because when you add the veggies the chicken has only been cooking for a few minutes. Thanks for asking, Sylvie! Hope you enjoy this classic takeout dish at home! Loved it! Staging was a great idea and it really helped to insure the food was added and cooked to perfection. Thank you! I’m confused on step 2. Up above under “Velveting” you said to either use the egg white or the whole egg. Yet in Step 2 you say egg yolk and 1 tablespoon of cornstarch. As for Step 1, I usually wash and dry the chicken breasts and lay them on a plate and put into the freezer for 15 to 20 minutes. This makes it easier to place your hand flat onto the breast and carefully slice horizontally through the breast making two cutlets as opposed to calling them strips. Chicken breasts come in many different sizes and shapes. That being said, I only downgraded it because of the confusion of directions. I’m anxious to try this recipe as she usually has great ones that I’ve tried and kept. Hi Shirley! Thanks for catching the mistake on the egg! That’s the ol’ pastry chef in me coming through (since we use yolk for glazes). This recipe should be with the whole egg used (not just the yolk). As for the cutting of the chicken, we all have our different ways of accomplishing the same cut. I don’t know that cutting them into cutlets prior to cutting them into strips is ideal, though. That would create skimpy strips of chicken as opposed to the heartier chunks that we want here. I agree that freezing for short time firms up the meat to make for easier cutting. But, for safety’s sake, I disagree with washing prior to freezing. The FDA, USDA, and numerous public health departments, discourage the washing of raw meats as it encourages the spread of bacteria in your kitchen. Your thorough cooking will eliminate any nasty bugs you don’t want, so the washing isn’t necessary. I think, with your help, we’ve made this recipe foolproof. Thanks so much for your keen eyes! Emma here, managing editor. Yup, I agree with Marta on the chicken-cutting instructions. The main goal is to just get bite-sized pieces that are all about the same size and shape — however you achieve that is just fine! I’m having difficulty visualizing step #1, in orientation. Feeling dumb, unsure if I should be cutting horizontally from thin to thick, vertically on a diagonal from tip to thickest part, or vertically creating a thick and a thin cutlet. ?? Also, would it make sense to pound the chix to even thickness for even cooking? Sound like a recipe I’d definitely like to try, especially the velveting technique. Hi, Norm! Emma here, managing editor. We struggled with how to describe this as well and kept going back and forth as we were editing! It’s surprisingly hard to describe how to cut meat. The goal is really just to create bite-sized pieces that are all about the same basic shape and size. Anyway you achieve this is fine. I like your idea of pounding it flat! I agree with Emma, Norm. I never knew how difficult it was to describe cutting meat, so don’t feel dumb at all.